Sometimes the best music is haunting in its beauty. We're all fans, reluctant or not, of fun music, the stuff that makes you want to move and elevates your mood like some kind of sonic superdrug, and yet, the craving remains to hear something so beautiful, elegant and nearly tragic that it evokes tears of the heart. This is how bands like Depeche Mode and Joy Division came into our lives. But it's also why a powerful score or an incredible opera or symphony can so easily manipulate our emotions. Music is such a visceral medium that it can change your mind and move you, it can psyche you up or drag you down. And with our ability to consume music so quickly now, hearing hundreds of different artists and styles over the course of a single day means we can almost control the fluctuations in our spirits. Even if the music still tends to control them. When an artist excels at altering their listeners without the aid of lyrics, it's a notable and monumental achievement. Classic music was that way, and so is the Neoclassical music of today. Dustin O'Halloran does this with a piano. 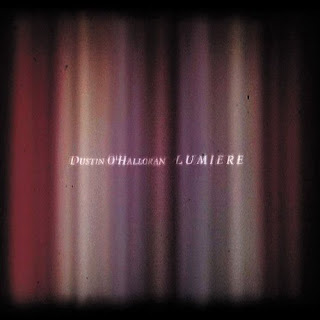 And his new album Lumiere is a sweeping, beautiful and tragic masterpiece. O'Halloran is most recognizable from his work on Sofia Coppola's Marie Antoinette soundtrack where he was featured three times on disc 2 with his "Opuses 17," "23," and "36." He combines a careful, almost melancholy piano that trickles across the keys with soothing, soft strings. He is a true modern composer, a true classical musician working in modern times, and his work is rarely joyful. Rather than punctuate the glorious moments of life, O'Halloran's music functions to underscore the menace, sadness, ennui and fear that permeates our shared existence. We forget, I think, in a world so wrapped up in language and saying things the right way, a world of quipped one-liners and fast talk, that instruments alone can say so much. Music creates, defines and mitigates our world. And so often we perceive our existence based entirely on the sound around us. Lumiere is its own world. The album is its own emotional landscape. Like a rainy day in the city where no one is around and walking alone feels so completely and utterly individual, as if the world itself belongs to you and only you with its empty sidewalks and the pervasive sense of perfect calm, Lumiere creates a bubble around you when you hear it. It creates that rare space in which sadness is not sad, it's just the absence of elation. Perfect calm. Over nine tracks, O'Halloran holds his style and doesn't experiment too much. The mood is too important here to interrupt. So when Lumiere opens with the spare and quiet "A Great Divide" the album will not and does not suddenly blast into a collection of sweeping crescendos. "Opus 44" and "We Move Lightly" both pick up the pace slightly, as the piano becomes a little more playful, but we're always riding minor keys and progressions with elegant time and pace. "Quintette N.1" brings in a heavy wall of strings to start, but allows them to fade to the back so O'Halloran can present a piano narrative that becomes progressively more beautiful and catchy (really) until the strings come back in for what could be considered a chorus. Really, O'Halloran seems to hold a lot of common compositional interest with Radiohead, just without the electronics and without the words. But perhaps the greatest achievement on the album is "Fragile N.4," a song so perfectly concocted and beautiful that it climbs from sadness toward the sky and then bounces back down, but it also has such a brilliant instrumentation that it feels more full. It's the kind of song that makes you want to be living, it's the song that plays over the final moments of your favorite character in a film. It is inspiration and disaster mixed together. And the closer "Snow + Light" delicately falls out into hushed airiness. Lumiere deserves a chance to break and mend your heart. You can listen to it in the player below.